Ph.D. in Remote Sensing is a higher grade academic program in the domain of science and technology with a specialization in the domain of remote sensing and observation. As a doctorate-level academic certification course, it is pursued by those candidates who have completed their M.Phil or equivalent education. The minimum eligibility criterion for admission is 55% marks at M.Phil or equivalent level in the respective domain. Admissions to the course are done on the basis of percentage of marks obtained by the candidate at M.Phil or equivalent level. The fee for Ph.D. in Remote Sensing course ranges from INR 12,000 to 3.3 Lacs across various colleges and universities in the country that are offering the course. The variation in the fee is based on the location and type of university that is private/deemed or government. Candidates looking for financial assistance in face of funding or fellowship for the course have to fulfill the required eligibility criteria (along with clearing of a respective exam for that purpose) in order to receive the grants. Ph.D. in Remote Sensing doctorate holder has a variety of options to choose from in terms of his/her career. He/she can make a start with firms/areas such as data collection, planning and management, security, resource extraction etc. Doctorate level students in the domain are equipped with the knowledge and application of the subject in practicality and are thus suitable for undertaking various roles at the practical level. A fresh pass out can expect a starting salary of anywhere between INR 21,000 to INR 24,000 per month. The working in the domain involves both practical as well as academic soundness with the fundamentals of the domain. Eligibility M.Phil. or equivalent from any college/university with a minimum of 55% (relax able for reserved category candidates) marks. Top recruiting areas Data collection, planning, and management, security, resource extraction etc. Job Profiles Remote sensing specialist, Satellite engineer, Data analyzer, GIS executive, Professor, Surveyor etc. Ph.D. in Remote Sensing: What is it About? The domain of remote sensing deals with the scanning and observation of the earth by satellite or high-flying aircraft in order to obtain information about the same. The expansion of the utilization of the field of remote sensing in resource exploration, security, and topographical analysis has called for more and more qualified professionals to take the centre-stage. Ph.D. in Remote Sensing course includes study of remote sensing adopts a multi-disciplinary approach to channelize research and development for solving real-life situations. The advancement and development in the area of space science and technology have opened up more dimensions for academic and professional development in the domain. As an academic level program offered at the doctorate level, Ph.D. in Remote Sensing course is aimed at delivering holistic research-based domain specific skill and knowledge to the students so that they can contribute in a sustainable manner. Through theoretical analysis and practical research the course achieves its designated goal and in meanwhile transforms the students into a subject specialist. Colleges/universities across the country offer Ph.D. in Remote Sensing as a doctorate level course to candidates who have passed their M.Phil or equivalent education from a recognized state or central University. Interested candidates can make an application for admission to the above-mentioned Universities and colleges. One can also search for an option in face of institutes offering the course in their local region/region or distance learning option in case he/she is not willing to relocate for the purpose of their doctorate. Candidate must have passed their M.Phil or equivalent level examination with at least 55% (45% to 50% for reserved category candidates) of the marks from a recognized state/private/deemed or central University. Certain Institutes grant admissions through Common Entrance Test (CET) like UGC NET. To get admission in these institutes candidates would have to qualify the respective entrance exam by securing minimum qualifying marks. The eligibility criteria’s mentioned above are common to most of the universities and colleges across the country that are offering Ph.D. in Remote Sensing course to the students. Most Universities/Colleges offer admission based on the score of CET (like UGC NET) or conduct their own entrance test for admission into Ph.D. in Remote Sensing course hence students would have to make an application for such exams. Ph.D. in Remote Sensing: Who Should Opt for? Students who have a career in the domain of resource exploration in mind. Those who have an academic background in the domain. Those who are looking for a career as Data Analyzer. Those looking at a career as a researcher. Ph.D. in Remote Sensing pass out students have plenty of options to choose from in terms of their career. 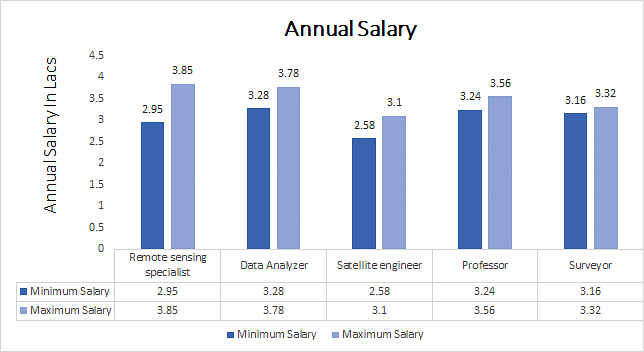 One can choose to work as Remote sensing specialist, Satellite engineer, Data Analyzer, GIS executive, Professor, Surveyor etc. To provide you a holistic view of the career prospects of the course we have tabled certain areas and the respective roles attached to the same where Ph.D. in Remote Sensing holders in the respective domain can look for in terms of their career.